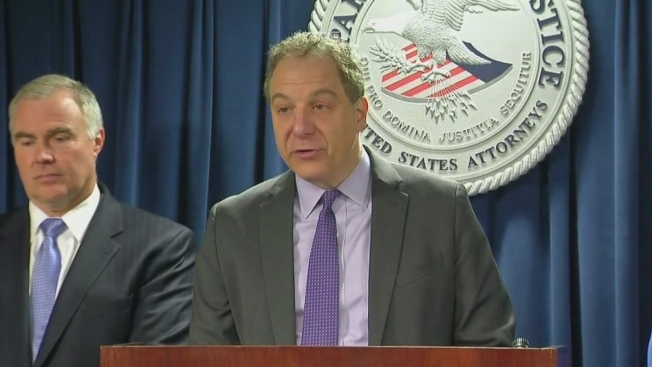 U.S. Attorney's Office: David Wright is a Terrorist"
Wright's uncle, Ussamah Rahim, told Wright on a recorded phone call later that month that he couldn't wait to attack Geller and decided instead to go after "those boys in blue," referring to police. Wright told his uncle that was "beautiful" and encouraged him to delete all the data from his computer before carrying out his attack. Wright cried on the stand when he spoke of his uncle, insisting that he didn't think Rahim was serious about the attack. Wright, who was more than 500 pounds in 2015, testified that he used Islamic State group propaganda to get attention but was just playing a role and never wanted to commit violence. "I didn't want my uncle to get hurt. I didn't want law enforcement to get hurt," Wright said. "I lost someone who was very close to me because I was so deluded and self-centered that I couldn't see beyond my own need for attention." Prosecutors said Wright was the leader of the conspiracy and recruited his uncle and others to help him wage war on the U.S. Wright's uncle received directions about the plan to kill Geller from Junaid Hussain, an Islamic State group member and hacker who was later killed in an airstrike in Syria, prosecutors said. Wright conducted online research for guns, swords and tranquilizers that put people to sleep instantly. He created a Twitter page seeking recruits for their "martyrdom operation cell," collected a trove of horrific Islamic State group documents and videos and created a manifesto warning that America's "days are numbered," prosecutors said. Wright's uncle bought three large knives - one for each of them - for their attack on Geller, authorities say. Wright "was committed to ISIS, and knew exactly what he was doing," Assistant U.S. Attorney Stephanie Siegmann told jurors, using an acronym for the Islamic State group. In a press conference following the verdict, the U.S. Attorney's office said Wright is a "terrorist." "Together, Wright and his uncle planned to murder Americans. And those plans were as real as the long knives Wright's uncle bought to carry them out," officials said. "When rhetoric turns to action and American lives are at risk, the U.S. government will take action to ensure the public is protected." The third man accused in the plot, Nicholas Rovinski, pleaded guilty last year to conspiracy charges and faces 15 to 22 years in prison. Rovinski, of Warwick, Rhode Island, testified against Wright, telling jurors that Wright said Geller "deserved to be beheaded" because she insulted Mohammad.